Sharm el Sheikh is a particularly stunning coastal resort and lies along the southerly coastline of the Gulf of Aqaba. Located close to both the Ras Mohammed National Park and also Tiran Island, Sharm el Sheikh is part of a thriving tourist industry in this part of Egypt. 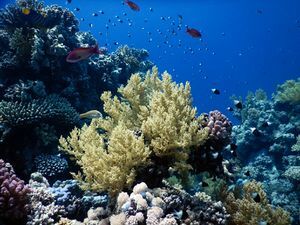 Surrounded by beautiful sandy beaches, turquoise waters and glorious coral reefs, each year huge numbers of tourists head to Sharm el Sheikh to scuba dive and marvel at the underwater life which is so concentrated in this spot. The Sharm el Sheikh area offers two main bays, which are adjacent to the very center of the resort. Na’ama Bay comprises a number of developed tourist resorts and is really the heart of the action, with a prominent shopping center and great places to eat out. The nearby bay of Sharm al-Maya lies to the west of Na’ama Bay and is centred around the bustling Sharm Old Market, a walled location where you will find bags of characters and plenty of cheap eats. Sharm el-Sheikh (شرم الشيخ, also transliterated as Sharm ash Shaykh and popularly known simply as “Sharm”) is a well-known port and resort town at the southern tip of the Sinai Peninsula in Egypt, popular with package holiday makers and divers. About 9,000 British tourists are in Sharm on any given day. Numbers have doubled in the last 3 years and seem set to continue to rise despite the worldwide economic situation. referring to the large number of international peace conferences that have been held there. It was known as Şarm-üş Şeyh during Ottoman rule and was known as Ofira during Israeli occupation between 1967 and 1982. Sharm el-Sheikh is one of the most popular tourist destinations in the Arab world. But there are also some very good reasons to visit it if you are not the common tourist, who likes to lie on the beach all day. It is one of the finest diving spots in the world and a trip into the desert is an unforgettable adventure. The Sinai Peninsula is a remote desert mountain range. The rocky mountains are parted from the deep-blue sea by a flat desert strip. This combination of desert and sea is an incredible sight and makes you believe you are on a different planet. About 40 years ago, Sharm el-Sheikh was nothing but a small fishing village with about 100 Bedouin citizens. When Sinai was occupied by Israel in 1967 Sharm el-Sheikh started to develop as a tourist destination (like the rest of the peninsula). Israelis evacuated Sinai between 1979 and 1982, following the signing of a peace agreement between the two countries. 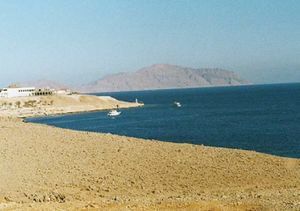 Since the 1980’s the Egyptians have been continuing the development of Sharm where the Israelis left. Sharm’s 100 grew into a bustling 10,000 population. There is now a nice promenade, a Hard Rock Cafe, one of the most modern hospitals in Egypt and so on. generally warm and dry, although summer months can be humid. The best times to go to Sharm el-Sheikh, for swimming and diving, are the month of April, and from mid-October to mid-November. The summer, from mid-May to September, is actually quite hot, and while the sea is pleasantly warm and you can enjoy long dives, it can be difficult to sunbathe and move outdoors during the day (especially in August and September). The water temperature is always warm, although cold snaps may affect the region occasionally each winter. In winter the stay can be enjoyable, and the temperature is often sufficient for sunbathing, however, the days are quite short. Na’ama Bay part of the city is the center of nightlife and dining: most of Sharm’s clubs, cafes, restaurants and shops are here. Sharm el Sheikh has grown into three distinct areas now, Nabq is a new area to the North of Na’ama, Old Market and Hadaba to the South of Na’amaa Bay. Nabq Bay Nabq Bay is on a promontory overlooking the Straits of Tiran at the mouth of the Gulf of Aqaba. Sharm el-Sheikh city has been subdivided into five areas, namely Nabq Bay, Ras Nasrani, Naama Bay, Umm Sid, and Sharm El Maya. Together with Hay el Nour, Hadaba, Rowaysat, Montazah and Shark’s Bay, it forms a metropolitan area of 42 square kilometres. Sharm el-Sheikh Airport (IATA: SSH) (ICAO: HESH) is the largest in the Sinai and receives planeloads of charter tourists daily in the winter high season. Domestic flights from Cairo are offered by Nile Air  and EgyptAir . Your travel agent may have trouble booking flights with them but they can also be booked on some of the online booking engines. For departures: timetable shows only nearest 1-2 hours, makes you watch over the row of check-in desks for your flight number. sandwiches, coffee, Egyptian sweets; outlet of Caffè Ritazza international chain coming soon (also in Athens, Budapest, Madrid, Milan, London, Paris, New York, Stockholm, Zurich, Vienna). After security check there is a Patisserie offering lucums, khalva and other Egyptian sweets. International Fast Ferries run fast boats to Hurghada on the mainland Red Sea Coast, currently running four times weekly. The ride takes 1.5 hours and costs EBP250 one-way, EGP450 return for foreigners. Warning: this ride is notoriously bumpy and prone to cancellations. Sharm el-Sheikh can be reached by driving down the eastern coast from Eilat (Israel) via Nuweiba and Dahab, or via the western coast from Cairo. There are daily buses for both routes. From Cairo,East Delta buses take approximately 8h (EGP80) while Superjet buses take 6 hrs. When taking the bus from Cairo, keep your bus ticket and passport handy, as you will pass through a number of checkpoints, which require passengers to present identification and ticket. The drive is interesting with beautiful scenery, throughout the route. is about 1km from the Peace road. If you should arrive during the evening hours your only option may be to take a taxi, as micro-bus service can be spotty. Since Sharm is a tourist-driven economy, you should be prepared to do some bargaining. If you are of the hiking type, the main road is, roughly, twenty minutes from main road. Just ask anyone to point you in the direction of Peace road. Once at Peace road you should have no problem hailing down a micro-bus. When heading to the bus station via micro-bus, it should be noted that, as of February 2009, there were no direct routes, which go down Peace road, to the bus station. In order to reach the station, you must indicate that you are going to the bus station, and want to be left off at the gas station. This may take some work, given the limited English skills of the drivers. Once at the gas station, you should see micro-buses, which will take you on the final leg. 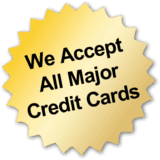 Remember, transfers are not issued, you will need to pay another fee for the final leg. If your journey is within a kilometer or two, the cost should be about (LE 3 to 5 LE). If your stop is further out, or if you are travelling during the late night hours, be prepared to get a demand for more money, in some cases drivers may demand up to (LE 10 or LE 20). Demands for higher fees can also take place, if the driver feels he you have money! So, be prepared to negotiate. If the drivers fee is unreasonable simply get out, this will often bring down the cost. One final note on fees, when arriving, ask a local how much the bus costs before hailing one down. The information provided will give you a base-line price, from which you can bargain with. In Sharm the taxis are generally modern models, either Hyundai or Chevrolet. Don’t bother with the meter in the taxi,it probably does not work any more,they soon break due to the dust,and would work out more than the “fixed” prices anyway. Always note the drivers ID number. Don’t assume they have meters. Locals tell you they don’t. Make sure you have transportation waiting for you, or better yet take an airport Limo which has a fixed advertised rate inside the arrival hall at the airport. is the worst part of Egypt for getting a reasonably priced taxi. They will ask for 150-400 LE for the 10 minute ride to Nabq. So, make sure you negotiate a rate lower than the limo advertised rate inside the arrival hall. Make sure you have Egyptian currency to pay the fare and never pay before you reach your destination making sure you only pay the pre-arranged price. Make sure that the driver knows that you are paying in Egyptian pounds. There are also a fleet of blue and white micro buses which are used to ferry the locals around the region. These are a most economical method of transport compared to taxis however they are not by law allowed to accept tourists. It can be cheaper and more convenient to hire a private minibus; Sharm-Taba €75, Sharm-Dahab €35 (price are per minibus, not per person, correct as of Jan 2013). Sharm Old Town Hail a taxi to take you to to the Sharm Old Town, ask the driver for the old market. This is a much different experience for tourists staying in the Na’ama Bay area. A visit to the desert is highly recommended. Various trips to the Bedouins, the beautiful Coloured Canyon and beyond to Mount Sinai. The more adventurous should try to find a private guide, who takes them for a few days into the mountain desert with a camel. You will walk through hidden valleys, rest at secret oasis and during the night you sleep under a breathtaking firmament. is a great experience with beaches completely deserted and beautiful mangroves. A complete contrast to the resort. An unusual sight and a bit exotic for a westerner are huge fans pumping fresh air to street cafes and terraces near hotels. Enjoy the sight and sound experience and the live show at Alf Lela w Lela (A thousand and one Nights) everyday. the live show is amazing, with different shows featuring a great male Belly Dancer well known as Mero, and other belly dancers. Also some egyptian weddings, tanourra dance and shows. Diving is the main activity in Sharm el-Sheikh. When you dive into the warm water of the Red Sea and leave the remote desert behind, you will enter a world full of life and colours. The reefs of Tiran and Ras Mohammed are known as two of the best diving-spots in the world. They can be reached by boat from Sharm within two hours. Ras Mohammed is the name of the southern most point of the Sinai peninsula. There, the current of the Gulf of Aqaba meets the Gulf of Suez. Due to the increase of plankton in the water the amount of fish is incredible. Huge schools of Barracudas, Sharks and Morays can be seen there every day. Before 2011 you may have found 20 dive boats at each site however today with a decline in tourism divers are able to enjoy quieter dives and at times have sites to themselves. The wreck of the SS Thistlegorm is generally regarded as one of the finest wreck dives in the world. However, it can also become very crowded with divers but less often now due to decline in tourist numbers. A diving safariallows the possibility of diving beautiful reefs way beyond the reach of any day tripping boats. The costs of dive safaris vary depending on the distance covered and standard of the boat. Marina Divers Sharm, Concorde el Salam Resort (White Knights Dive Site close to the airport), . 8am-8pm. A family run dive centre est. 1991 offering SCUBA & Snorkelling in a friendly and professional environment. Blue Lagoon Sharm, New La Perla Hotel (Close to El Fanar in Hadaba), . Divers International, Sofitel Hotel (North end of Na’ama Bay), ☎ 0020106770462, . 9AM-6PM. Oonas Dive Center A small, friendly dive centre at the quieter end of Na’ama Bay offering daily diving and all PADI courses – discounts for internet bookings. Millenium Dive Center, Sharm Resort & Plaza (10 Minutes from the Airport in direction of Na’ama Bay), ☎ 0020693604266, . 8AM-6PM. PADI five star diving centres with own daily boat and trips to Dahab and Thislegorm. Mr. Diver. A friendly dive centre based in the Marriot hotel offering a full range of PADI courses. Best and most comfortable way to explore the magnificiant undersea world of the Red Sea is snorkeling. wide, wind protected bay, perfect for novice snorkelers too. Hotels can be found here: Jaz Fanara, Sentido Reef Resort, Faraana Reef Resort.